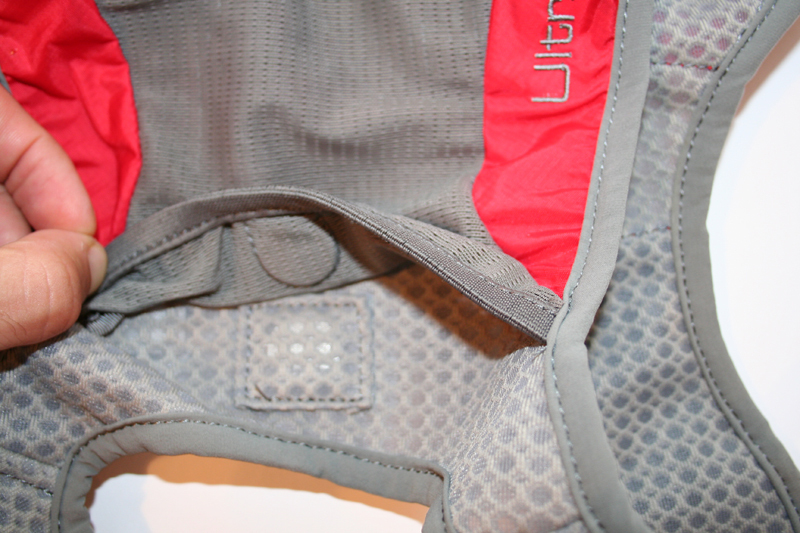 The UltrAspire Spry is a lightweight race vest designed for runners who prefer to carry bottles. 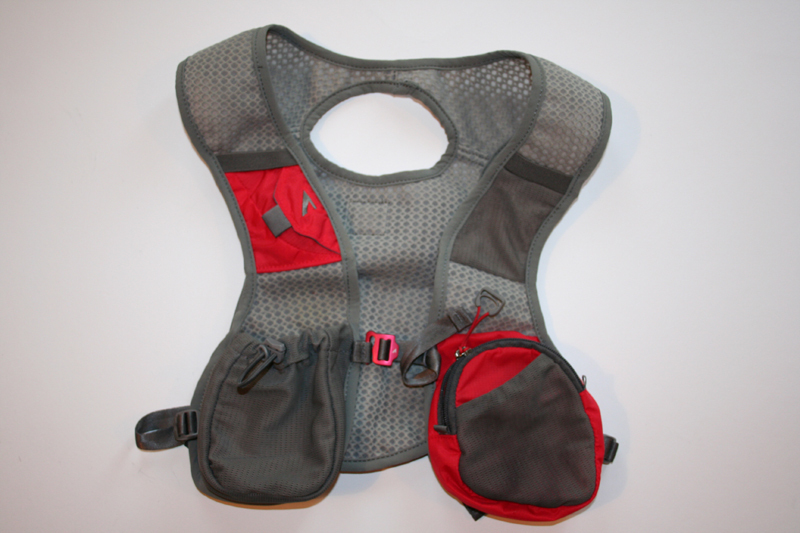 The race vest is small, lightweight and can accommodate a small bottle in the front pouch. It is ideally suited for long training runs or Ultra’s where a minimalist approach is desired. 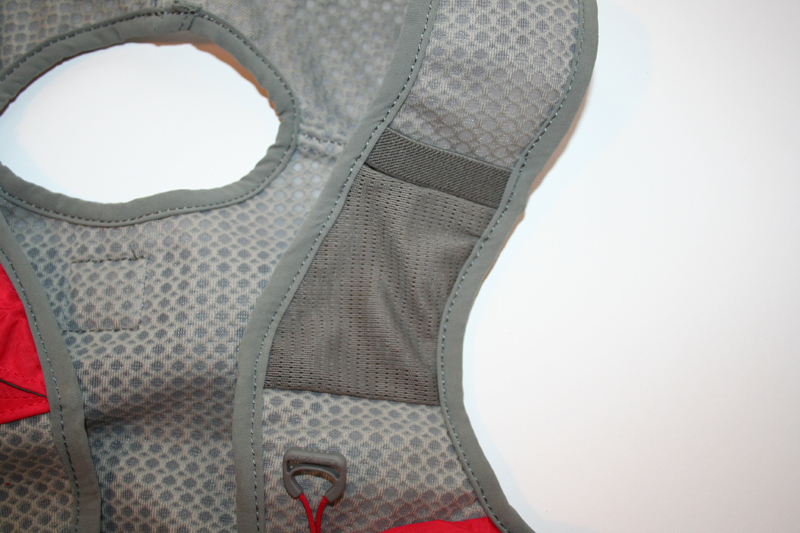 The race vest sits comfortably over the body and the weight is barely noticeable. 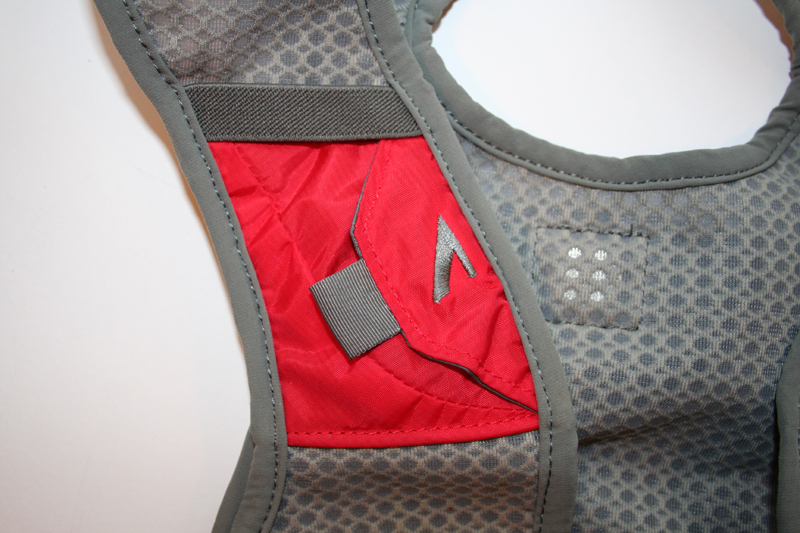 The vest is made from a mesh type material, which allows the body to breathe although coverage of this vest over the body is pretty minimal. 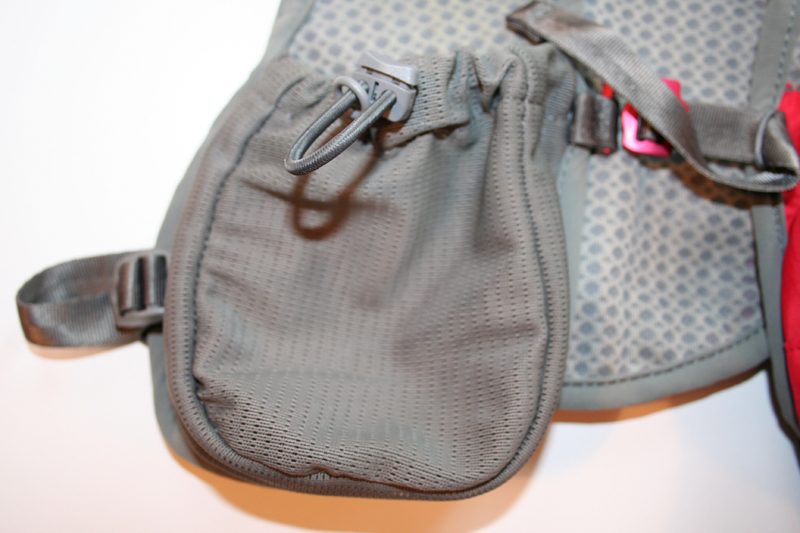 The lower right hand side of the harness features a small mesh pouch with a thick drawstring cord for the pouch, which can be used to carry small bottles.This could easily hold a typical 500ml bottle of water, coke or iso-tonic drink although this would not be a snug/tight fit as a 500ml bottle would likely be longer than the size of the pocket. Below this sits a zipped pouch, which is large enough for a mobile phone and some small snacks or gels. The zip is contains 3cm of cord and a plastic clip to make it easy to open the pouch when wearing gloves for example. On top of this sits an outer mesh pocket for small items or litter. 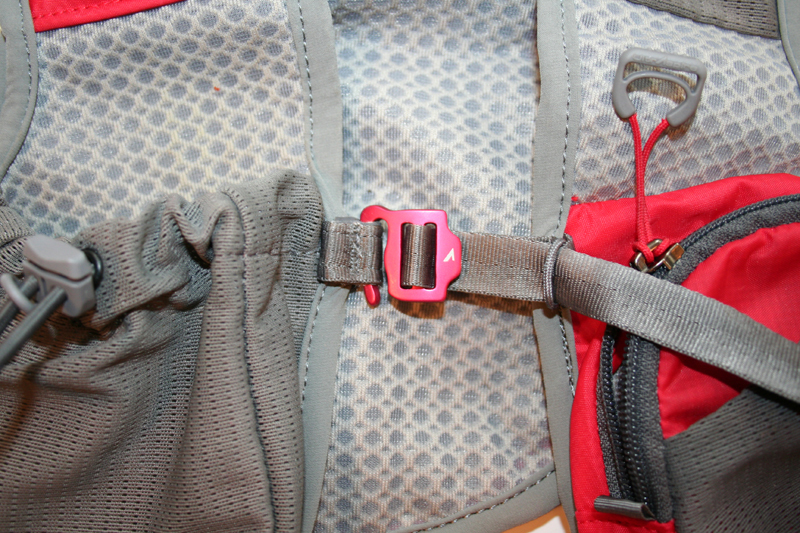 The harness is connected to the rear of the pack by two adjustable straps on either side, which can be adjusted to fit. The harness is secured by a small “speed hook” aluminium clips which sits across the breast area and the pull of this can be adjusted to make it closer as required. My preference is to have everything tight to avoid any unwanted bounce. The pack contains a rear stash pocket, which uses a further magnet to seal it open and shut. The stash pocket is large enough to hold a few small items of food or equipment or a rain jacket. 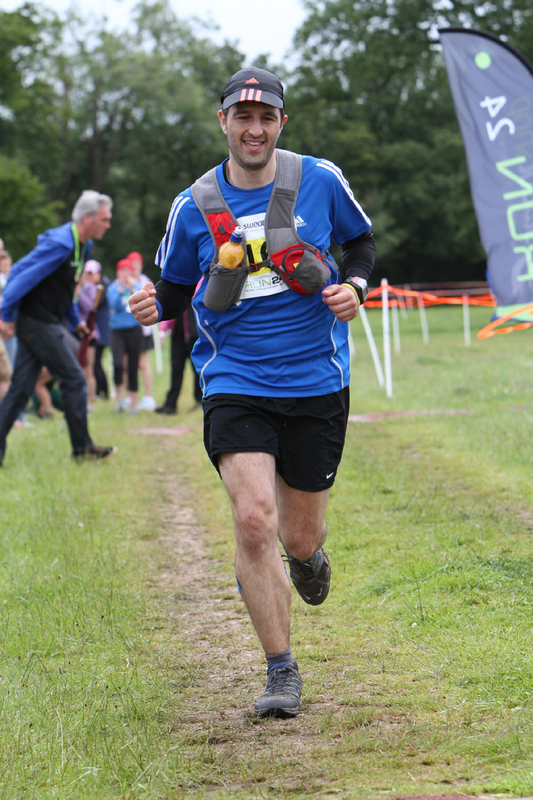 I had the opportunity to trial the pack at the recent Run 24 event which involved 24 hours of running 5 mile trail loops. The UltrAspire Spry for me was the perfect choice as I wanted to carry a couple of items of gear and food but as I could replenish supplies every 5 miles, storage capacity could be kept to a minimum. I’m not a personal fan of waist-packs/bum-bags as I don’t find these overly comfortable and tend to bounce around. I also wanted quick access to items and the pocket and the pouch on the front is ideal. My strategy for the run was to pick up a chilled bottle of drink each lap which I placed in the pouch. In the front pocket I carried a mobile phone, gel and a snack. I put my electrolyte tablets in a small plastic button bag inside the magnon pocket to prevent the tablets from disintegrating if they warmed up through my body heat. Initially, I carried a cap in the rear stash pocket but during the evening, the event required competitors to take their head torch and I stashed a head torch, batteries and backup hand torch in this pocket until required. During the night phase, I switched these out and replaced this with a base layer top when this got cold. I must admit to the fact that whilst the rear stash pocket was easy to open, it sat high on my back and I couldn’t always reach in and grab what I wanted on the go. Therefore, I had to slip the pack off (which was easy to achieve) and then grab items out the rear. 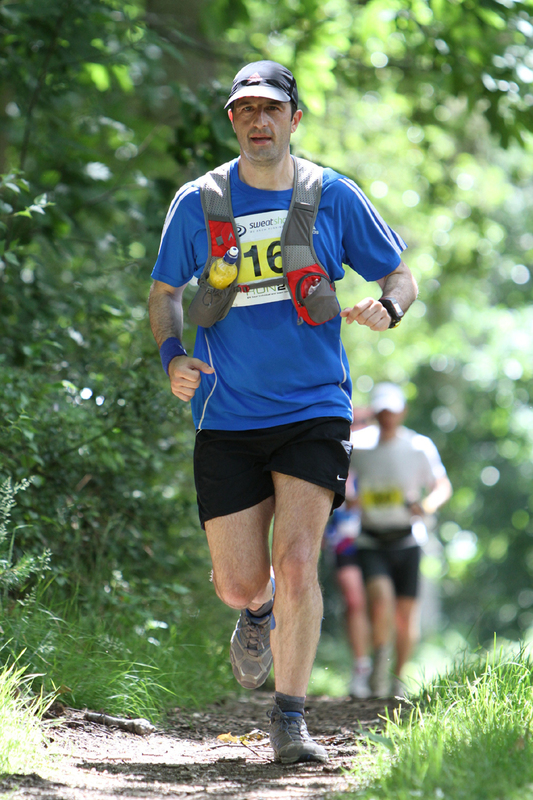 I wore the race vest fairly tight and found it to be light and comfortable and I hardly noticed the weight. The front trash pocket was extremely useful for an event of this nature as I could drop the rubbish off each lap. The only item to report was that my mobile phone could be felt against the rib and so I switched the contents of the pocket around to make sure there was something softer resting on the breast. 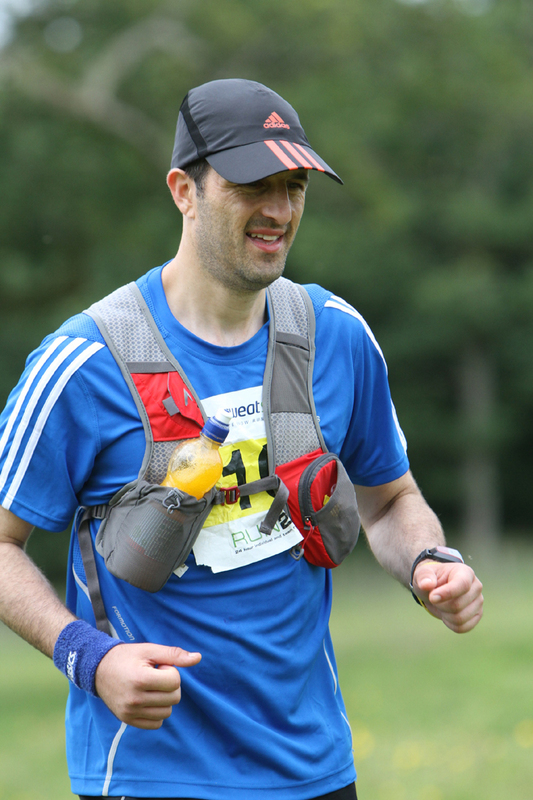 The pack was perfect for this type of event carrying my essential requirements and would be extremely useful for smaller Ultra’s where the runner prefers to carry handheld bottles or long training runs. 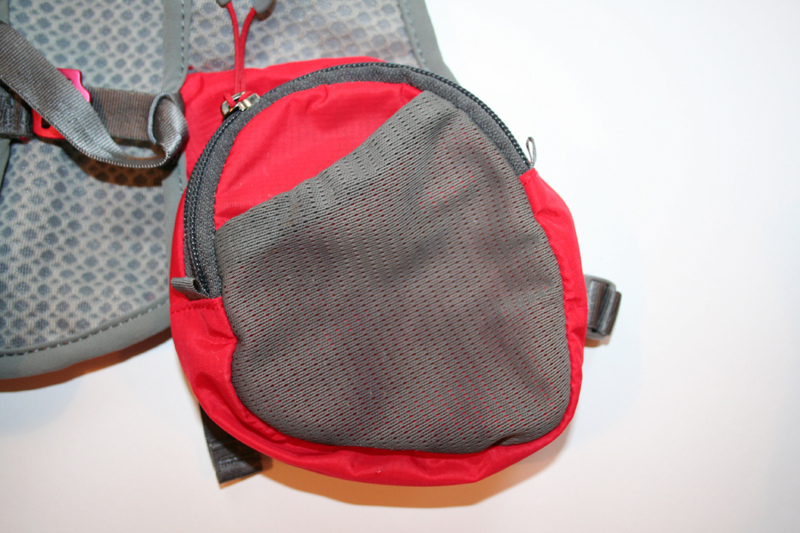 The rear stash pocket could be used to hold a small hydration bladder if required. Overall, I liked the race vest and would definitely use it at events. * Quick stash right pocket is large enough to hold a spare bottle or other essentials and uniformly compresses with cord. * Patent pending Magnon Electrolyte Pocket™ with easy worry-free magnet closure. * Left mesh pocket over zippered inner pocket for securely stowing night time accessories, energy foods and other necessary gear. * Roomy stash back pouch for easy access to Jacket, raingear and extra foods. * Sliding lite weight sternum strap and adjustable side webbing attachments for comfortable fit.